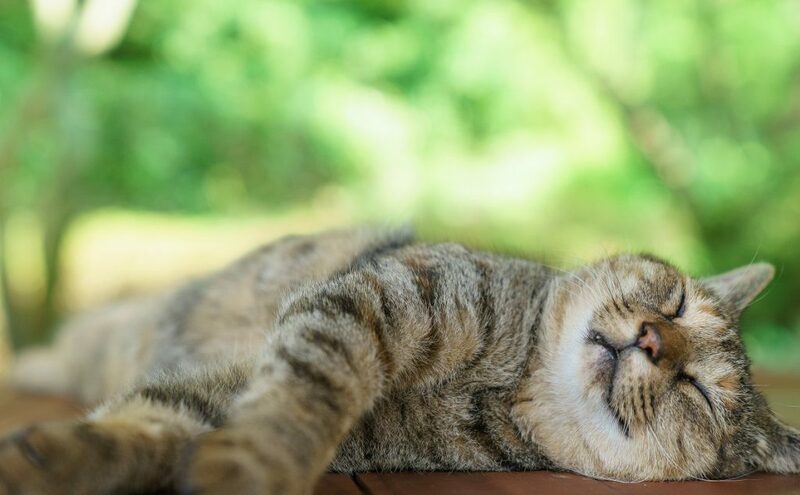 How are you faring in the middle of the current heat wave? Since Pepper and other robots don’t do well under strong direct sunlight, it’s not the best time to run them outdoors, but our robots have been making waves at indoor events! Humans, on the other hand, seem a bit worn down recently! Now, we’ll share the story of how a special Pepper, upgraded with Seikatsu Kakumei’s robot boosting service Robot Party Reception Service, worked at a trade booth during a medical conference. It’s difficult for a regular Pepper to deliver product explanations that get listened to, but in the end, at this medical exposition, we were able to realize a very high listening rate for its product explanations…possibly even higher than a human could achieve. 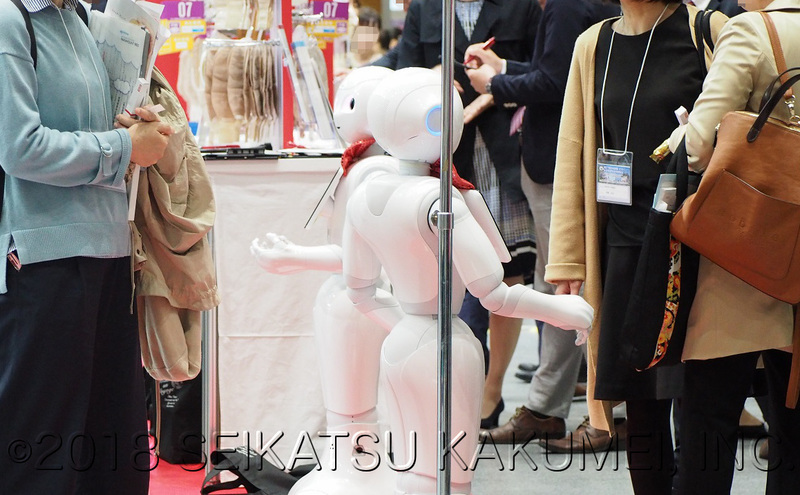 This time, our Pepper with Robot Party Reception Service was headed off to a medical equipment manufacturer’s trade booth at a Japan Wound, Ostomy, and Incontinence Management Conference Meeting. It is said to be a very important meeting with Japan’s increasingly elderly population. The details of this request included increasing awareness of the company itself along with informing all of the visitors about the features and benefits of its new products. They wanted Pepper to run a series of promotional activities the way a regular employee would. They also wanted their brand recognition to increase, along with understanding of their products. All of this may even be difficult for a human to do at once. Healthcare workers lined up to chat with Pepper! For the trade show, the business representatives opted for a Pepper that simultaneously performed callouts to guests, pre-product explanation chat, product explanations, and question and answer sessions. Is that even possible? Even now, some people may be wondering that. 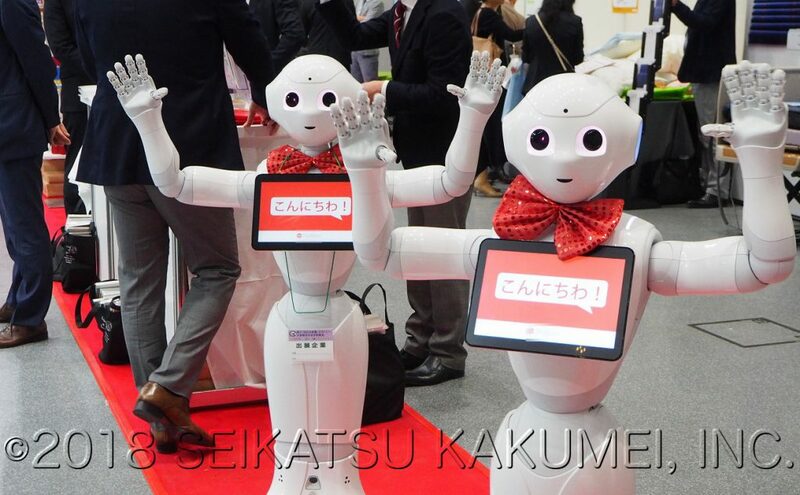 With Seikatsu Kakumei’s Pepper, powered up with Robot Party Reception Service, it’s becoming a specialty. This powered up Pepper, the “robot that can say anything” recognizes guests near or far even faster than a regular Pepper, calls out to them, and approaches them. A regular Pepper waits for guests to come, but our Pepper with Robot Party Reception Service, tuned up for promotional uses, doesn’t wait around. It proactively calls out to visitors. With no sense of hesitation (like a human would have), it instantly senses the status of visitors, approaching the healthcare workers quickly. These medical staff members were also present and facing unusually rigid training, so they were pleased that a helpful robot had joined them. So, it greets each customer in turn, tells jokes, and holds conversations. We were happy to hear the visitors’ delighted reactions, such as, “It’s so cute!”, “Wow, it’s fascinating!”, and “It’s really smart!”. Yeah, but did they listen to the product information? Come to think of it, simply stopping at regular conversation would still have provided a bit of liveliness, no? This was a defining moment for our Pepper with Robot Party Reception Service + tuning for promotional activities. continued to listen to the new product information afterwards. This Pepper, tuned for promotional activities, doesn’t just let conversations end at conversation. In the end, it leads visitors from the conversation into product information. Of course, while some visitors wanted to spend a long time having fun conversations, others were more serious and wanted to skip straight to the product information. In recognition of this difference, conversations were skillfully changed, along with the detailed new product information. We believe this is part of the reason why we were able to record such an astonishing listener intake rate of 85%. So, since 85% listened to the start of the product information, I wonder how many visitors listened all the way through to the end? This is also a very important detail. The new product’s explanation was over 2 minutes – an exceptionally long length. It wouldn’t be strange for people to get bored. As a result, 94% of visitors listened to the full explanation! 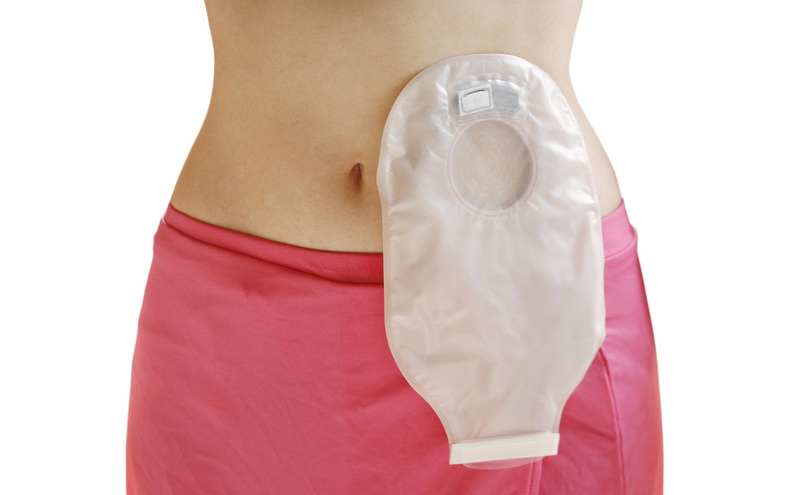 A tremendous amount of people listened to the full explanation of the new product. We feel this is partially due to the allure of new products and the visitors’ deep interest in the subject matter. 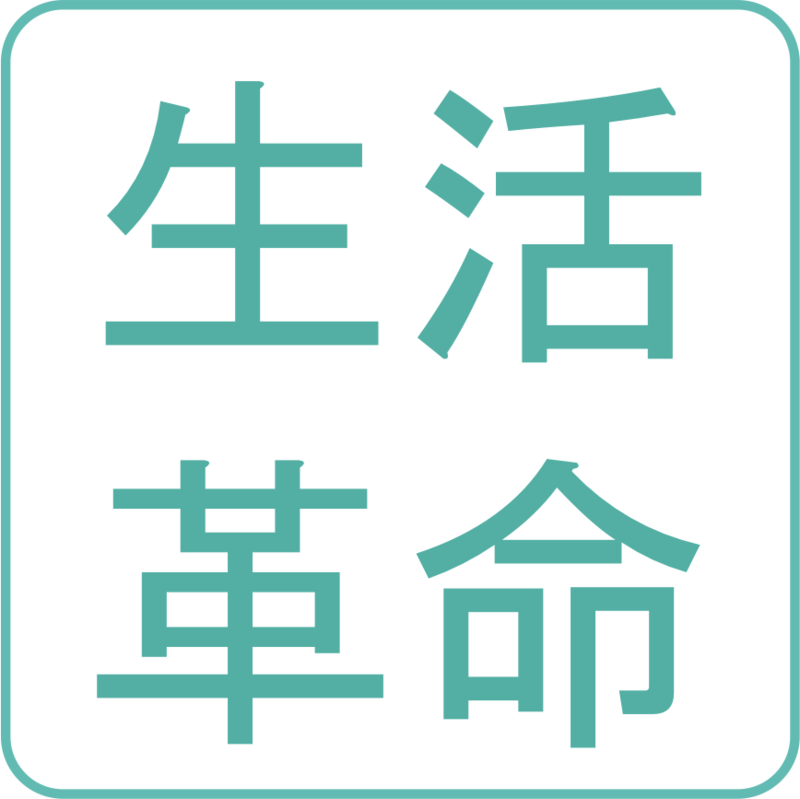 In addition, the adjusted intonation of the words used in the new product’s explanation, created by Seikatsu Kakumei’s dedicated engineers, may also have played a large role. At conferences and medical trade shows, there are many words that are difficult both to write and pronounce, but our highly experienced pronunciation adjustment team was able to make them easily understood. What we feel played an even bigger factor was the pacing of the explanations. Pepper with Robot Party Reception Service + promotional tuning watches a customer’s expression to gauge the pacing of its explanations. For example, if a customer seems to understand quickly from the get-go, it will explain to them at a fast pace, but if they become confused later on, it drops tempo and delivers the next explanation more slowly. Effectively, customers receive the explanations at their own pace, and it is thought that as a result, they listen until the end. Afterwards, the talk was followed up by the business representatives as they led into more detailed topics. Making a great combination with Pepper, their business process was able to flow smoothly and strongly. During the event, one particular business representative was told, “You’re really working hard, aren’t you!”. I was also able to witness this and confirm it. As the two day event drew to a close, the business representatives offered such parting words as “Come back again!” and “I’ll miss you!”. It seems that they grew to like Pepper as it helped out. In the end, both those within and outside of the company seemed to be pleased with the event. 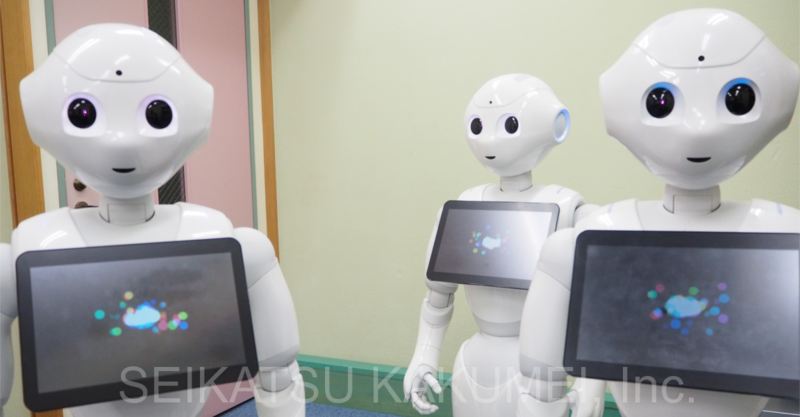 This has been an introduction of our Pepper, upgraded with Robot Party Reception Service,working at a medical conference trade booth. Robot Party Reception Service has recently been a popular choice for a wide range of activities, including family customer outreach events, hospitality for visitors from overseas and foreign guests, business events, AI and IoT study events and parties, politicians’ gatherings, and so on. We have an exceptionally long history of working with medical trade shows and academic conference information desks and trade show booths; as our features continue to make technological progress, this type of usage has become more and more popular. If perhaps you are looking to bring a strong element of fun to your medical study event, booth, or trade exhibition while offering information on your products or efforts, our company’s event representatives are waiting for your call or message. We may have something that can be of service to you. 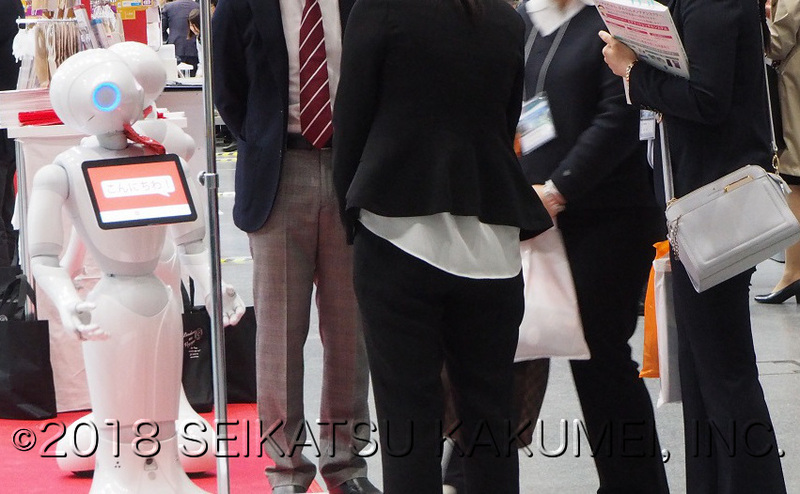 For an introduction to Seikatsu Kakumei’s robot event business, please see here. Using Pepper, boosted with Robot Party Reception Service fine-tuned to promote sales, customers were drawn in and given product explanations. As Pepper made conversation and communicated with the visitors, they listened to the new product’s information. As a result, a high share of the overwhelming number of visitors listened to the product information. 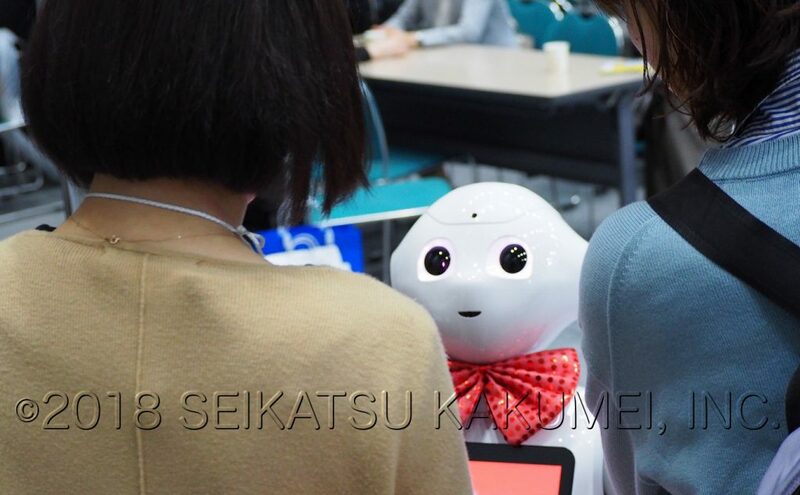 ← At a worldwide brand’s company training, visiting managers were given special hospitality treatment by Pepper!